Right now, the Great Migration, one of the most extraordinary animal spectacles in the world, is occurring in East Africa. Over one million wildebeest, antelope, and zebra migrate from Tanzania’s Serengeti Plains to Kenya’s Masai Mara National Reserve in search of food and water. While there is no clear start or end to this annual 1,800 mile journey, late June through the month of July is the best time for viewing wildlife in Kenya’s Masai Mara. In late July, herds continue north following the rains into Kenya and the Masai Mara Game Reserve. The animals must pass two rivers: the Mbalangeti and the Grumeti in the Serengeti and the Mara River in Kenya. The waters run rapidly and crocodiles, concealed by vegetation in the waters, eagerly await their arrival (safaris do too!). The river crossing is an amazing spectacle sought out by travelers and wildlife enthusiasts. Watch a short video from National Geographic to see shots of this incredible feat. Once in the Masai Mara, the animals are stalked and preyed by larger carnivores such as lions, hyenas, leopards, and cheetahs. This part of Kenya has one of the densest lion populations in the world. In late October, the wildebeest move south to the Serengeti to close the circle before the migration begins again. 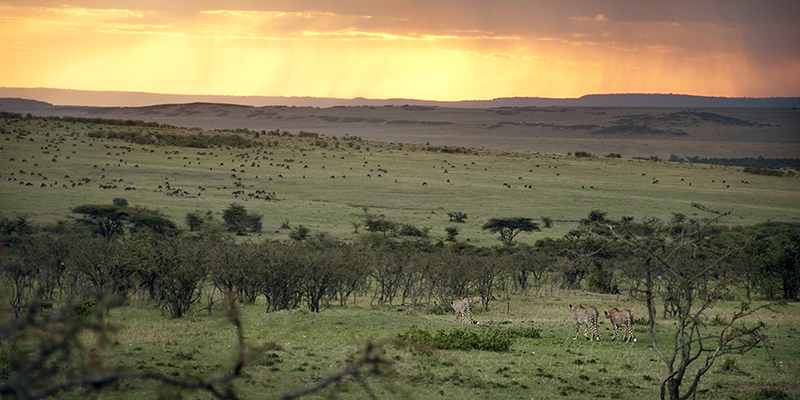 Check out these incredible photos from the Masai Mara and a panorama of the Great Migration. If you want to be at the center of the action next year and see the annual migration in the Mara National Park, you can stay at the wonderful Encounter Mara camp. You’ll pay the same amount you would no matter who you booked it with, but a portion of the proceeds will benefit the Naboisho Conservancy and right now, their need to increase the number of rangers that are out on anti-poaching patrols. Booking with Travel On The Good guarantees an extraordinary trip that gives back to the conservancy and its wildlife, so the animals continue to come back in droves year after year. If you’re going to go, why not go on the good? Previous Africa Travel Trends – What’s Up?